The Mojave Experimental Flyin is always a great place to walk around and bump into people smarter than you, and one of the recurring themes amongst this group of awesome folks was a need for instrumentation of surface positions to complete the AirDAQ architecture as a flight test tool. 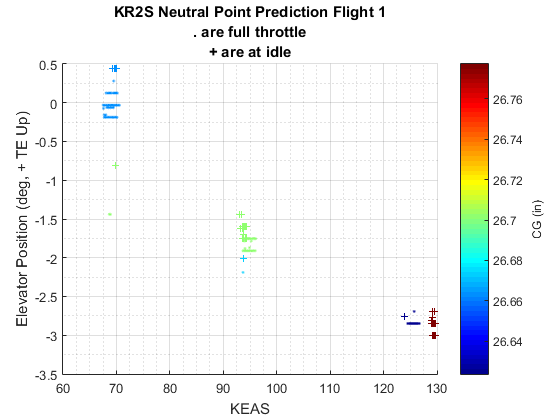 Diane Barney had taken an interest in the KR2S' "quirky" longitudinal stability, so I got to work on an elevator position string pot and she got to work on a test plan for a neutral point prediction. A couple of days later, I was calibrating the PotDAQ on the KR2S's hstab. It turned out to be a pretty cool piece of hardware. It uses the same temporary attachment scheme as the air data boom, an industrial-grade string potentiometer, and a repurposed air data computer from a Featherweight boom. It's still a little bit bulky, but it provides repeatable measurements of surface position down to about 0.15 degree. Knowing what CGs we were targeting, we came up with a fuel management strategy for flight one to keep us in the appropriate CG range, and Diane whipped up a card. The first sortie went well, with good test flow keeping time in the air down to a minimum. We did run into a handful of issues during the flight. The KR has some CHT issues that kept the climbout shallow and local. We also noticed some issues with the interaction between the PotDAQ and the Featherweight boom - this showed up mostly as the PotDAQ data coming through but blocking the boom's data. 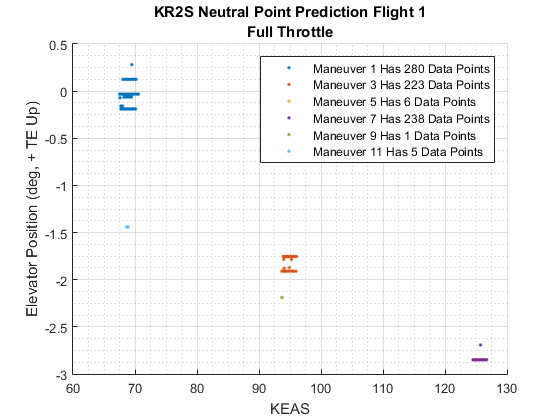 As a result, many of the points suffered from a crippled dataset from the boom. Diane's analysis plan also relied on the header tank's indication being accurate, but we noted a difference of roughly 1.5 gallons in header quantity indication between the alpha at 65 mph vs. the alpha at 140 mph indicated, meaning a bit more gray matter had to be spent to determine the CG at each test point. Fortunately, none of these issues got in the way of some really cool data. 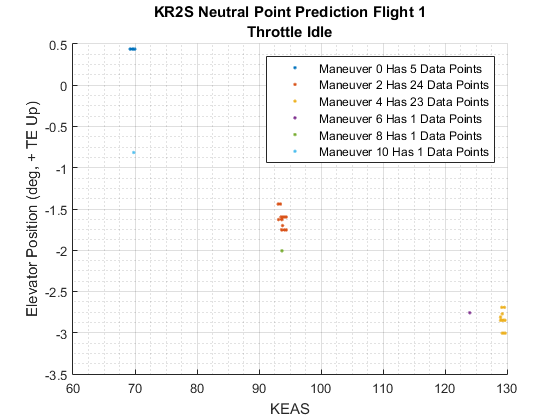 Analysis credit for this one goes to Diane - after pulling together best-estimate CG data using fuel transfer times and combining both card and boom data to fulfill the air data instrumentation requirement of the test, she produced the plots below. The colormapping technique to pull out correlations with different parameters is way cool. The most startling thing to jump out of these plots was the ridiculously small amount of elevator position between 70 KEAS and 130 KEAS. Even at a the moderate CG used for this test, we only saw about 3 degrees of variation. My knee-jerk response to this is to suggest that it means we were very close to the neutral point, but further testing at more forward CGs will shed some light on this number. The colormapping also points out a noticeable correlation between weight and elevator position that we didn't see coming - a good example of why this analysis technique is so powerful. The correlation with CG is less pronounced, and in this case, suggests our fuel management kept the CG shift negligible throughout the test. 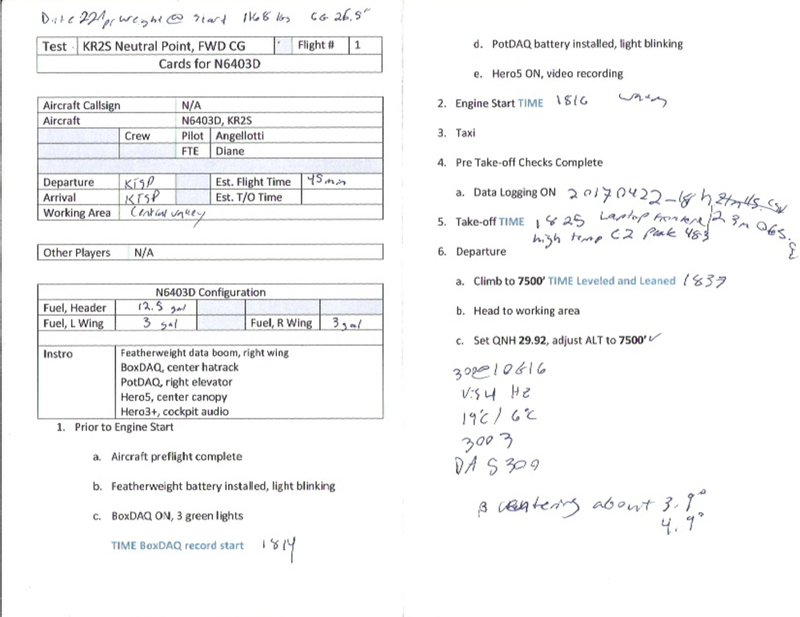 Next steps are a repeat of this flight once some of the data and cooling issues are fixed, which should help establish some repeatability. This will be followed by a forward CG flight with a single crew in the KR and chase pilot/FTE with remote data acquisition, which is a perk of this instrumentation system that I'm really excited to get out into the daylight.